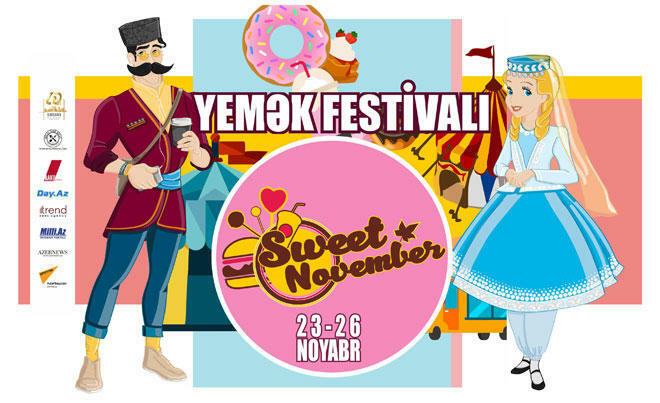 A long-awaited food festival "Sweet November" awaits Bakuvians on November 23-26. The food festival, supported by the State Historical and Architectural Reserve "Icherisheher" and the culinary project "Meal for Real" will take place near the symbol of Baku, Maiden Tower, Trend Life reported. 1. A variety of tastes! Where else can you find more than 30 different dishes per 100 square meters? Of course, only at the festival of food, where everyone can enjoy a variety of various dishes for every taste, discover something new, or create own palette of tastes! Open-air concerts and open-air cinemas are good, but there's not much to eat and drink. Sweet November festival allows you to combine business and pleasure at the same time. For example master classes, that usually are held in a stuffy room. Here you can watch the work of the best chefs while drinking a glass of mulled wine. Yes. Many restaurants will delight visitors with all sorts of goodies for free. The rest of the cafes and restaurants, even those that usually "bite" with their prices, will pleasantly surprise you with small price tags so that everyone can discover their cuisine. 4. The longest fall party ! Imagine a party that lasts four days, from 11:00 am until late in the evening, right, this is the Sweet November Food Festival. The festival will give the sea of best music by DJs so will never freeze, even in the most windy autumn season. Where, if not at the festival of food, you can get to know the most advanced and brave restaurateurs, cooks, food bloggers? You can ask why brave? Because, contrary to the templates, they leave the cozy kitchens of their luxury restaurants, and go to an adventure called the Street Food Festival. This is an experiment not only for restaurateurs, but for entrepreneurs who are just starting their long journey. Therefore, food festival and represents a kind of exhibition for networking of the restaurant industry.